Can we tell you a little secret? Summer is our absolute favorite season in Michigan. Of course there’s plenty of fabulous things to do all year round in this great state, but the summer allows us to maximum outdoor time to enjoy all of the great natural beauty the Mitten State offers. We also love it because the season is jam packed with fun events, festivals and fairs that celebrate what’s special about Michigan. 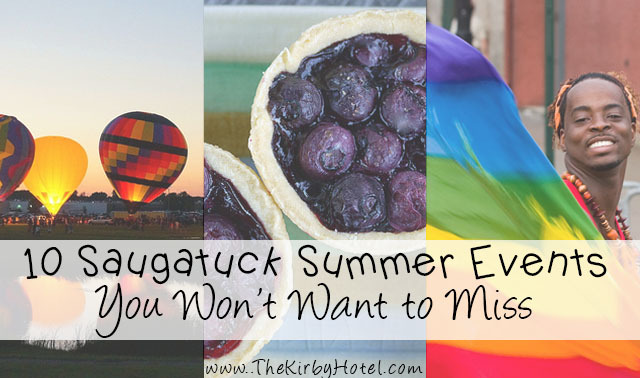 We’ve put together a list of some of our favorites in the area so that you can plan your summer stays at The Kirby to coincide with these exciting happenings. If you never got to see the Fab 4 in concert, take advantage of the next best thing. Shout has been called the best Beatles tribute band in the state and is very serious about staying faithful to the look and sound of the original group, even making sure they have the exact same models of instruments the band used. Don’t miss Founder’s Brewing Company’s annual beer and music festival, which takes place just 40 minutes from The Kirby. Enjoy local craft beer, delicious food and great live music under the sun – this year be sure to check out New Orleans legends The Dirty Dozen Brass Band! Make a whole day of it in Grand Rapids – after you check out the Founders Fest, make your way to the Western Michigan LGBT Pride festival. The fest boasts live music, a family-friendly dance floor, celebrity guests, a local craft beer tent and artisan vendors. Head just 30 miles up the coast to check out this fantastic annual art festival that features a whopping hundred juried artists showing off their best work. This is the perfect chance to get those one-of-a-kind pieces for your home that will always remind you of summer in Michigan. The 4th of July weekend is a great time to get away and spend a relaxing weekend at The Kirby. In addition to all the patriotic events going on, the weekend also includes this beautiful celebration of art along the Kalamazoo Lake. Get your laugh on with the hilarious Paula Poundstone, an acclaimed comedian, writer, and panelist on NPR show ‘Wait, Wait…Don’t Tell Me.” Her last show here sold out, so be sure to get your tickets now! Just a quick 30 minutes from The Kirby, you can witness the beauty and spectacle of seeing 30 hot air balloons floating in the sky. On the ground, there will also be an arts & crafts vendors fair, farmer’s market and vendor bazaar. Featuring live music, a beer tent, fireworks, a nighttime lighted boat parade and barbeque, this is one of our all-time favorite events of the summer. This year’s pirate theme should make the weekend even more fun! Head 20 minutes north for this lovely celebration of local family farms that provide some of the best fresh produce in the region. The fest features opportunities for fruit picking, wine tasting, wagon rides and sampling of local specialties. Delicious locally-grown blueberries are a staple of a Michigan summer and that’s what this fun festival celebrates. In addition to nibbling on all kinds of blueberry treats, you can also enjoy live music, a craft fair, classic car show, and sand sculpture contest. Pick your favorite events and give us a call to book your room at The Kirby for the ones you can’t miss!